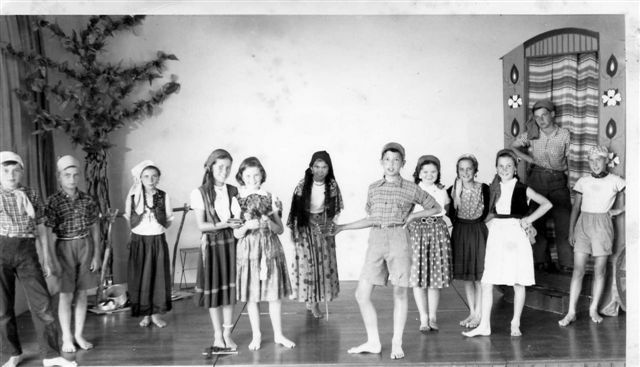 You are here: HomenextPlacesnextSchoolsnextSt Joseph's SchoolnextSchool play 1957? This was a very short musical ‘Little Gypsy Gay’. it must have been 1957 or 1958, I was born June 1947 so was 10 or 11, last year before senior school. I passed 11+ and went to Lourdes Convent along with Helen Tierney. She is still my best friend since we started school at St Joe’s in 1951. I remember a few names, Angela Storrow who is 3rd from left, also passed and went to Blessed Sacrament convent in Kemp Town. Julian Taylor is standing on steps of ‘caravan’, Barry Warner to his left. I am Elizabeth Matthews standing next to the caravan, Helen is on my right. The girl in the middle wearing black lace head-covering, is Irene Costello, the boy on far left I think is Michael Mackewitz.